The far northwest corner of Utah is one of the most desolate places of my home state, which by the way now boasts a population of over 3 million, mainly concentrated in the cities up against the Wasatch mountains. This corner, however, is a land of sagebrush and scrub and the population out here is sparse and widely dispersed. It's ranch country, with more cows than people. It's so remote that they built and tested the Apollo rocket engines and space shuttle engines out here just in case they blew up so no one would be hurt. 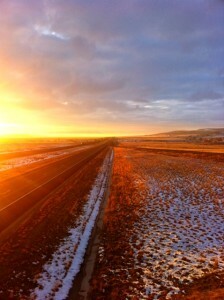 I drive across this corner of the state whenever I'm headed to or from my home in Seattle and my hometown of Salt Lake. On the bike I take the back roads, in the truck I stick to I-84. If you draw a straight diagonal line from southwest Idaho into the Wasatch Front of Utah where the population is you have I-84. A lot of people hate this road -- its straight as an arrow and there's nothing -- they think -- to see. 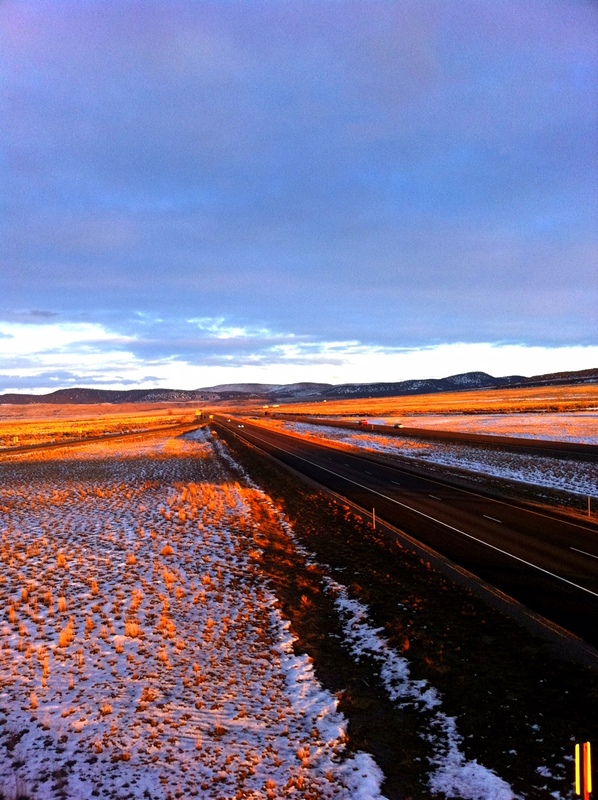 Traversing it, even at Utah's 80mph speed limit on the Interstate takes a couple of hours. 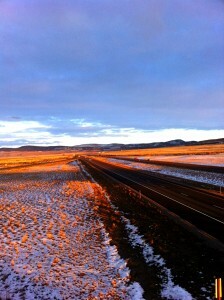 But I love this vast empty land here in the Intermountain West. In the truck, I just crank up the CD player, and hold it steady at 85mph and scan the horizon. If you look close you'll see a lot -- abandoned ranches, homes, barns, wells -- black dots that are cattle grazing and foraging for grass under the dusting of white snow. A couple of summers ago I was headed into Utah on my bike Angus, taking a back road down from Burley, Idaho, which runs way west of the Interstate I was on. I was being chased by a summer thunderstorm when I came across an abandoned cabin out in the sage and scrub. I stopped to photograph it for my "Western Storms" series and it has proven to be one of my favorite and best selling images. Driving into Utah for the holidays the other day I was rolling down I-84 in a little snow storm, looking at the abandoned ranches and trying to figure out how to get to them and take pictures on a future trip when that little cabin came to mind and I thought shooting it in the snow would be interesting. It would be a 40 or so mile detour but I was making good time and it was early in the day. I exited off and headed west towards Park Valley -- the warning sign at the exit saying "NO SERVICES Next Services 102 Miles - Elko, Nevada". It wasn't snowing heavily, and there was a light dusting on the road, but no tracks so no one had driven by in a while. As I neared the old cabin I put the truck into 4x4 and pulled off onto where I remembered the dirt track was -- now hidden under the snow -- and headed towards it, the tires sinking about 3 inches into the snow but with good traction. I came to a simple ranch gate and got out to open it and drive through, closing it behind me like those of us raised in the West are taught to do. "Gate open, leave open. Gate closed, close it". There ahead of me was the little cabin -- a dark dot in a blinding white landscape with no line marking the boundary between the earth and sky. The wind was blowing and it was 15 or so degrees so I bundled up and trudged over, walking around a few times and taking a number of shots. 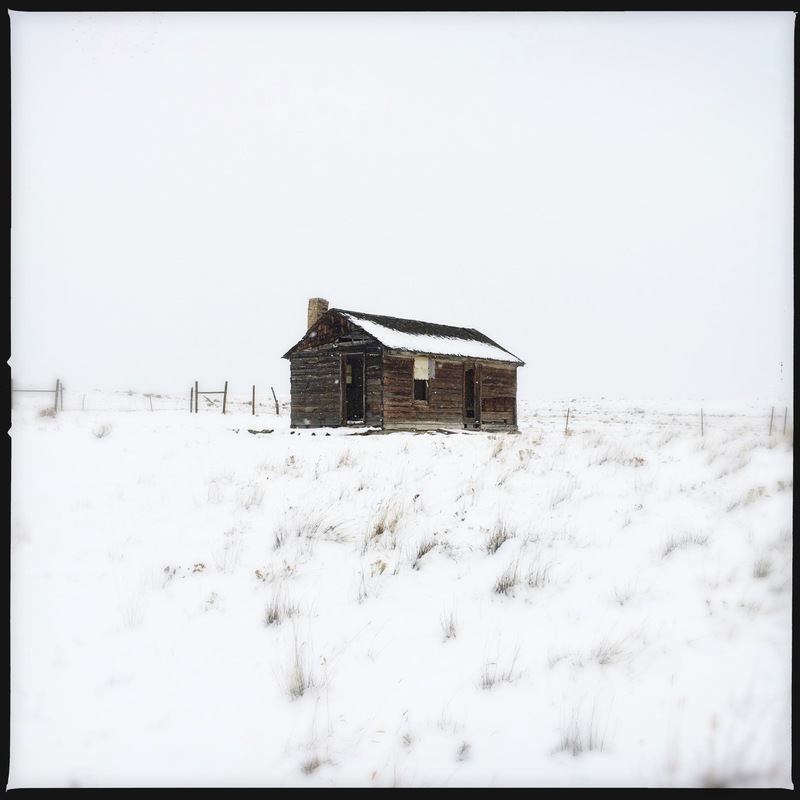 If it were possible the little cabin seemed even more desolate, more remote, and more foreboding than before. 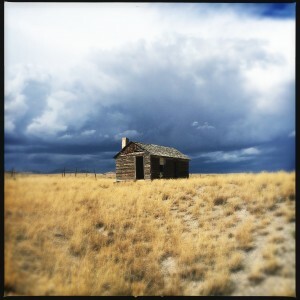 I can't even imagine living here in this remotest corner of Utah back when the original rancher or homesteader built this structure so many years ago -- how lonely and cold it must have been. I finished shooting, took a leak and wrote my name in the snow, said good bye to my little cabin and walked back to the warmth of the truck that I'd left idling with the heat on. I turned around on the field and headed back through the gate and onto the highway and turned east. The nearest town -- well actually the only town up in this corner of Utah is Snowville. It is often cited as one the coldest places in Utah, and with a name like Snowville you'd think that's why, but it's actually named after Lorenzo Snow an early president of the Mormon church. It barely qualifies as a town, with a population in 2010 of 164. The biggest thing in town is the Flying J truck stop on I-84, Its the only gas stop between Burley, Idaho and Brigham City, Utah, and so It sees a lot of business. But the true heart of Snowville though is really Mollie's Cafe. Mollie's sits at the only intersection in Snowville. Lord knows how long it's been there. The mini-van crowd on I-84 doesn't venture beyond the safety of the McDonalds at the truckstop if they stop in town at all. But the ranchers who live in this desolate remote corner of Utah all come in, their 4x4 pickups parked outside like cowboys used to tie up horses in front of the saloon. In all my times traversing this corner of the state I never stopped to eat here -- I usually was going through not anywhere near a meal time. But this trip it was 130pm and after I visited my abandoned cabin I thought to myself "I'll finally stop and have lunch there." Several muddy farm trucks were parked outside, and inside was a counter with stools and a few booths around the walls, a pie case by the old cash register, and a handful of cowboys and ranchers wearing their thick insulated overalls and cowboy hats sipping coffee or eating lunch. My waitress' name was Beth and she handed me a menu and smiled. I ordered coffee and a burger and fries, my standard cafe meal. A few minutes later she brought it to me but having left my camera in the truck I couldn't take a picture of the mountain of hand cut fries that came with it. I thought about running out to get it and taking some shots of the inside of Mollie's but to do so almost felt intrusive in a way so I decided not to. The food was good as expected and Beth came by and asked how I was. 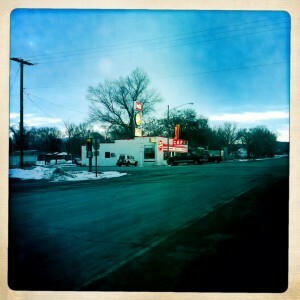 We got to talking about life in this remote corner of the Intermountain West and working at this little cafe. She said she was born in Snowville and went away for a few years to Logan, Utah. I guess its a matter of perspective but to her Logan was a big city. It's home to Utah State University but has a population of under 50,000. She said she felt like a "number" in Logan -- just another person. But in Snowville she said, "it's family. I know everyone, they know me and if I'm sick or don't come into work, someone will check and see how I am." About that time one of the ranchers had finished up and needed to pay his check and so she excused herself to take care of him, and then she hollered at me from down the counter "you want some Chocolate Cream Pie, Jack just baked one?" "Don't have to twist my arm" I said. She came back with the pie and sat down. I asked her how business was. "Mollie retired, and sold it to Jack this summer, he's back there cooking, and business is great. Other than the truck stop we are the only game in town and our customers love us." "I can see why" I said. I told her that I'd photographed her place before and showed her some shots I'd taken of the cafe and the area from my phone. I said I passed by a few times a year but this is the first time I'd come in. "It better not be the last" she said. I assured her it wouldn't be. By then it was 3pm and I was the only customer there. The snow had stopped and the sky cleared as the sun started its early afternoon descent as it does this time of year. A song by Don Williams called "Maggie's Dream" kept running through my mind. It's about a waitress who spends her life working at a diner outside of Ashville, NC, dreaming about what's down the road but never going. "The mountains around Ashville, she's never seen the other side, she's closer now to 50 than to 40...when the business starts to slow down she plays the saddest tunes and stares off down the highway and wonders where it goes, with nobody to go home to and it's almost time to close." I left a $20 on the table for a $9 meal and a slice of wonderful chocolate pie that she didn't put on the tab. "Merry Christmas" I said as I put my heavy coat back on "Merry Christmas -- drive safe and come back again!" Beth called as the bells on the door jangled as I opened it and stepped out into the cold. Looking both ways down the street there wasn't a single vehicle to be seen. The wind was blowing and it was 20 or so degrees. I climbed into the truck and headed towards the Interstate, turned left and onto the eastbound on ramp and headed up over the hills outside Snowville and out of this remotest corner of Utah and down the highway towards my hometown and my family -- Snowville and the neon lights of Mollie's receding in my rear view mirror. Just another person drifting down the Interstate into a big city. Although unlike Maggie, the waitress in the song, Beth doesn't seem to stare off down the highway wondering where it goes, she's gone and returned to her diner and is quite content there. And me? I still play the sad songs and stare off down the highway and wonder where it goes. And I've seen the other side of the mountains too. I'm home on either side, as well as on the road. I'm lucky.